Maximising the percentage share that CHP contributes to a system designed to operate at low temperatures is essential for optimum performance. Beata Blachut explains. Energy centres now often include combined heat and power (CHP) in a mix of different heating technologies, most commonly gas-fired CHP. In these cases, it’s important to maximise the CHP’s share of the heat and electrical energy supplied to the building to maximise the carbon and cost savings. It’s also worth noting that CHP percentage share is an important component in SAP/SBEM calculations. However, when traditional fixed-output CHP is used, its run-times are often limited by the system’s inability to cope with varying demand, so that CHP percentage share is not optimised. For example, if fixed-output CHP is sized to meet a base heat load, the electrical power output will be determined by the heating requirements of the site. So, if the base heat load is reduced, so too is the amount of electricity generated for the site. Similarly, if fixed-output CHP is configured to match the site’s base electrical load this will limit the contribution it makes to meeting heat loads. A more versatile solution is to use CHP units that can modulate their output and dynamically track site demand. In this way, the power output of the CHP is aligned to changing site requirements, providing effective management of the most expensive utility, the electrical power, to deliver maximum cost savings. Any excess heat is typically transferred to water in a storage vessel to ensure it is not wasted. A further benefit is that load-tracking CHP is able to ‘self-learn’ the building’s loads and adapt to changing conditions, such as reduced power requirements following an upgrade to LED lighting. With fixed-output CHP, such a reduction in power requirements may result in an electrical load that is too low for the CHP to be viable. Dynamic, load-tracking CHP can also be used in a modular/cascade configuration to provide additional flexibility across a wider range of applications. For example, five 20kWe/38.7kWth units can be combined to provide outputs up to 100kWe/193.5kWth. In its Applications Manual AM12 ‘Combined Heat and Power for Buildings, the Chartered Institution of Building Services Engineers (CIBSE) recommends operating temperatures for radiator circuits to be 70°C flow and 40°C return for new district heating systems/heat networks. The recommended maximum return temperature from instantaneous domestic hot water heat exchangers is 25°C. Therefore, one key element in designing CHP systems for optimum efficiency is to design for lower return water temperatures than are traditionally used in UK heating systems. 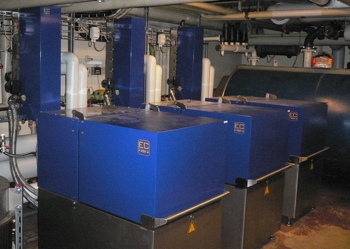 Low return temperatures help to improve the efficiency of the CHP and are also beneficial for other heat sources. For instance, the optimum primary circuit temperature differential ∆T for gas-fired condensing boilers is 55°C/30°C; for heat pumps it is 40°C/35°C. Additionally, lower flow water temperatures are better suited to the relatively mild UK climate, where heating systems are often ‘over-sized’ for the few very cold days we may experience each year. Another engineering challenge with traditional CHP is the need to operate at a constant delta T, while LTHW systems operate with a different delta T than CHP. To overcome this, a heat distributor incorporated into the modulating CHP units will ensure heat at a constant temperature of 80°C is always generated, irrespective of the return water temperature. The flow temperature to the system can then be set in a range from 60 - 80°C by using a two-port valve to vary the volume of 80°C water introduced to the mains and mixing it with return water from the site to achieve the target temperature. A Flow Master controller on the CHP unit determines the volume of 80°C water required, dependent on return water temperature. Thus a constant flow temperature is maintained irrespective of the site return water temperature. This arrangement ensures the CHP always produces high grade heat, minimising or even eliminating (periodically) the need to run back-up boilers. For the flow temperatures to be constant and the return temperatures as low as possible, the heat interface unit (HIU) controls need to be reliable and the system’s heat losses need to be tightly controlled. This requires the HIUs to incorporate self-acting pressure and temperature controls in both full and part load conditions as well as in stand-by operation. 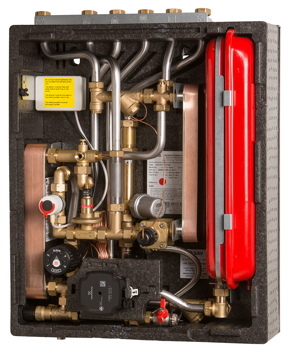 The pipework and connections between the HIUs and network need to be insulated and pressure independent TRVs must be installed on each heat emitter. This guarantees precise and stable temperatures at the taps, balancing of the heating circuit and fully controlled low system return temperatures. In addition, lower flow rates enable the use of smaller, variable speed pumps (compared to a system with higher flow rates), resulting in lower capital costs and reduced pump energy consumption. All of which means that the obvious way to maximise CHP percentage share and deliver optimum efficiency is to use dynamic, modulating CHP in a system designed to operate with low return water temperatures. *Beata Blachut is Technical Manager for LoadTracker CHP with SAV Systems.